A father, who has raised his children away from society, returns to society for his wife's funeral. With a poster evoking Wes Anderson, Captain Fantastic could fool you into thinking it's but the latest twee drama to roll out of Sundance - this year's Me and Earl and the Dying Girl (shudder) - but Matt Ross's movie stands on its own. Ever since the cult success of The Royal Tenenbaums and Little Miss Sunshine, setting your movie in the milieu of a quirky family unit has become an American indie cinema cliche. Sending said family off on a road trip, and subsequent journey of discovery, is an even less original concept. With a poster evoking Wes Anderson, Captain Fantastic could fool you into thinking it's but the latest twee drama to roll out of Sundance - this year's Me and Earl and the Dying Girl (shudder) - but Matt Ross's movie stands on its own. 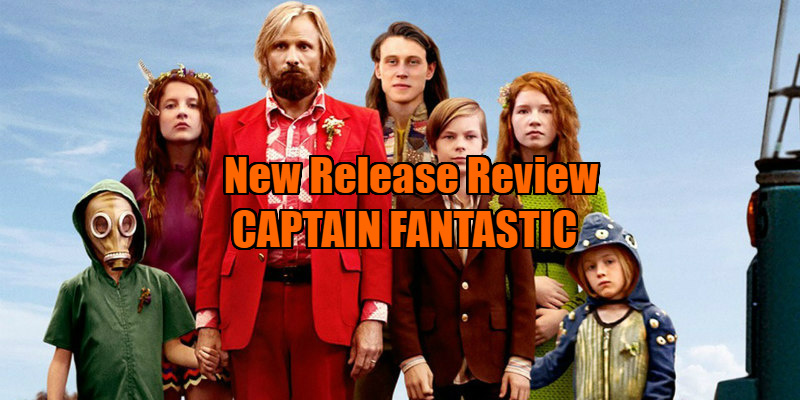 Sure, it mines comedy from its scenario, but there's an anger running through Captain Fantastic as unbroken as the white lines of its New Mexico highways. 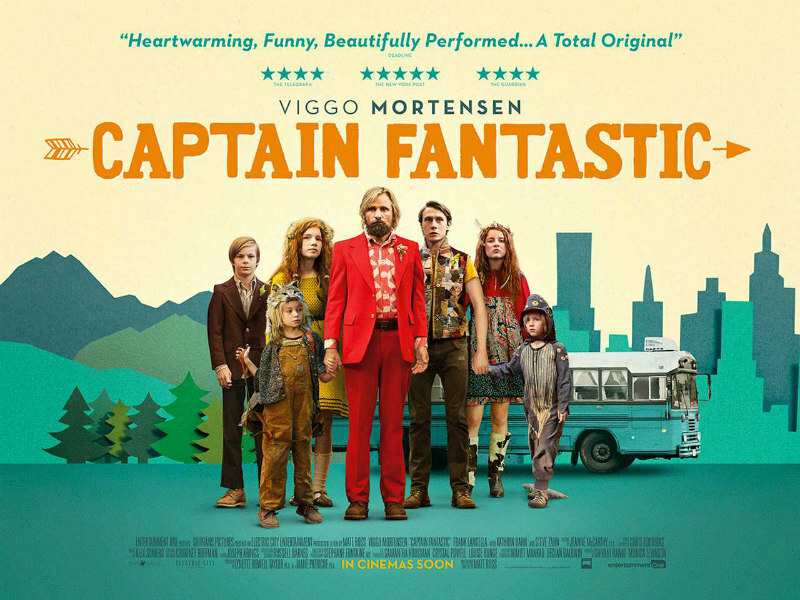 In a none-more-on-the-nose piece of casting, Viggo Mortensen plays Ben, who lives in the forests of the Pacific North West with his six children, ranging in age from an infant daughter to his college age son Bodevan (George MacKay). Ben makes a living through his carpentry, and home schools his children with a diet of advanced science, literary and philosophical classics, and physical training, including mountain climbing and deer-hunting. All is going well for Ben and his brood until he receives news that his wife has taken her life, having been hospitalised with depression. Despite her wishes for a Buddhist cremation, the deceased's parents (Frank Langella and Ann Dowd) have arranged for her to receive a Christian burial. Ben and the kids pack themselves into their Winnebago and set off for New Mexico in an attempt to halt the funeral. Though their Partridge Family appearance and societal naivete makes Ben's family a source of amusement, it's quickly established that these are protagonists we're going to be laughing with a lot more than at. Ben may well be a pretentious tree-hugger who celebrates Noam Chomsky's birthday as a national holiday, but he's undoubtedly well-meaning, and genuinely believes he's doing the best for his kids. The evidence suggests he's doing a pretty good job too. When Ben's sister (Kathryn Hahn) suggests the kids would be better off attending school, he instantly disproves her theory by showing her how his youngest child has a greater knowledge of American politics than her teenage sons. Life in the woods has given his family a physical superiority too. Meeting 'normal' Americans for the first time, the children are bemused by how overweight everyone appears. Of course, the great flaw of this sort of libertarian lifestyle is that ultimately we rely on society to look after us, and while Ben has imbued his children with a greater knowledge than their mainstream peers, he's also taught them how to lie, cheat and steal their way through existence. 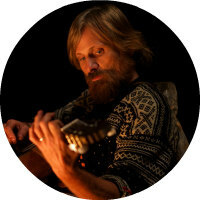 While Captain Fantastic doesn't blindly espouse Ben's off the grid philosophy, it quietly condemns the state of modern America that would make such a lifestyle attractive. Few American movies have displayed such an open contempt for religion and its influence on society. When an inquisitive cop asks Ben why his children aren't in school, the kids launch into a rehearsed routine of singing a gospel song. The cop leaves them be; seems you can get away with anything if you clothe it in religion! If John Hughes's road trip movies - Vacation; Planes, Trains & Automobiles - were tales of suburbanites conquering the wilds of America's open expanses, Captain Fantastic is the exact opposite, a tale of a man in love with America untouched, but finding himself inevitably bullied into joining the herd. As Matt Ross shows, we're all now living in Walley World. Captain Fantastic is in cinemas September 9th.